Every windows o.s comes with default calculator tool. I personally like that tool because of it’s simplicity and lightweight. But when it comes to calculator functionality, it doesn’t offer much calculation function with in it. 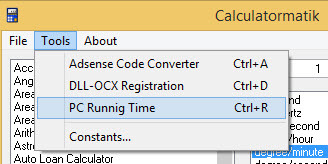 With that default calculator on windows, we can only perform some basic calculation. If you need to perform any complex calculation, then we have to use any other software or online calculation tool to calculate. If you are not a regular calculator user then that’s ok to search Google occasionally. But what if, if you are a regular calculator user? then don’t you think searching every time is an annoying and time wasting? Maybe, you could have already downloaded some calculator software to do your complex calculation. In most cases, your calculator software will have installation setup file, that means you have to install that software before you start using. Moreover, if that software is heavy, then it starts eating lot of memory resource and even it may take some time to launch that tool. 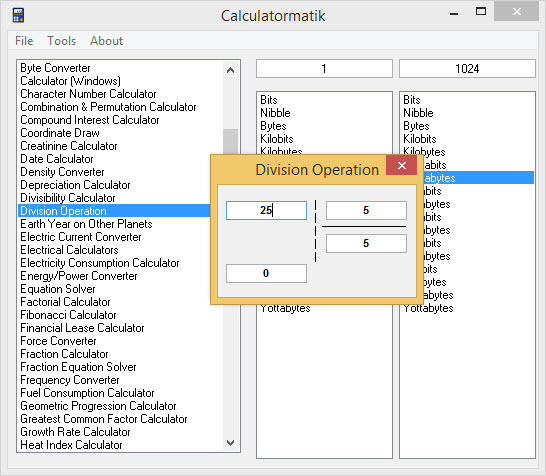 Most of those calculator tool comes only with some selective calculation function and it doesn’t include any other extra calculation function. Sometimes we need to do more than just calculation, that time again you may need to search Google for new tool. If you are using that calculator in single PC and have good RAM, then you can handle some of the above problem. But if you use that calculator tool on many other devices, then you should need something portable, lightweight, and easy to use tool. If you are in this situation, then we have solution for it. There is one calculator tool called Calculatormatik which solves all the above problem. This tool doesn’t comes only with calculation functions, but also includes conversion tool in it. Don’t worry, it won’t eat much resource of your PC. This tool is lightweight as notepad! Moreover, you don’t need to install that software to start using it. Just run this application to start using this. This Calculatormatik tool comes with lot of calculation and lot of conversion functions in it. I could have a list all those supported calculation function here, but it is very big list. So it is better to download yourself and try once. The user interface is very simple. It comes with 3 columns in it. The 1st column contains calculation and conversion functions, 2nd and 3rd column is used only when you select Converter function. If you choose any calculation function, then a pop box will be displayed to perform calculation. As you can observe, in the below image I have chosen Division Operation and a pop up box prompting me to enter values to perform calculation. As soon as you enter any values it displays the result there itself. The only drawback of this tool is, finding calculation function is somewhat difficult. If developer offer any search function then it will very helpful for user to search function. For time being, you use below tip to solve this problem. Tip: Type the first letter of the function in your keyboard to reach that letter related function and search from there. For example: If I want to perform Division related function, then type “D” in your keyboard by selecting any function. It will automatically reaches to all the function starting with D word. And there you pick division function. There is some extra tool like stopwatch, PC Running Time also available in this tool. You can access stop watch in regular calculation function list. To open PC Running Time navigate to Tools >> PC Running Time or press Ctrl+R from your keyboard. 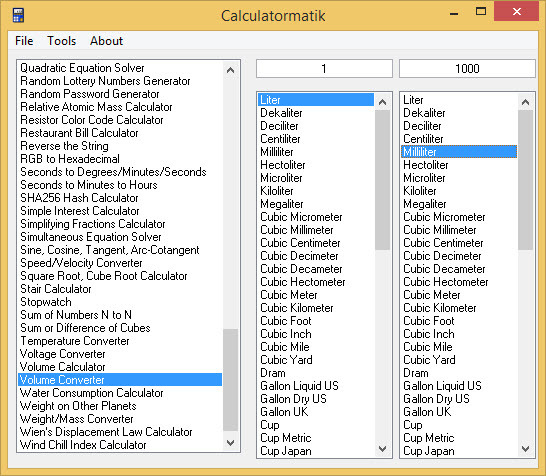 If you are looking for complex, lightweight and portable like calculator, then try this Calculatormatik tool. You can find almost all type of calculations and conversion in it. If you just use only basic maths functions then I don’t recommend this tool for you.